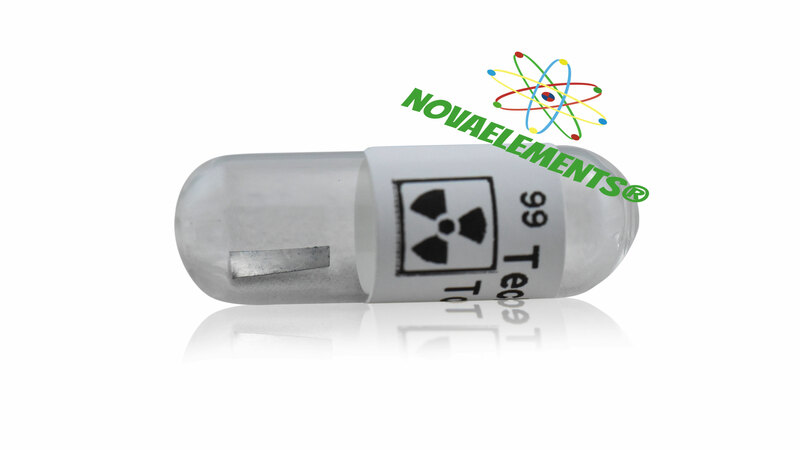 Technetium is the first element without stable isotopes. In Earth's crust it exists due to natural uranium decay, on Earth's surface as consequence of nuclear explosions. The long-lived isotope 98Tc has a half-life of 4.3 million years, which makes technetium moderately good researchable. It is a silvery, hard, relatively noble metal with attributes similar to rhenium. It has its most important application in medicine, where the isomer Tc-99 is a main substance for radio-diagnosis. This is made synthetically. This is a real Tc metal sample, Tc-99, in foil/strip form sealed in ampoule under argon and permanently casted in resina inside our glass vial with label. Pure sample of the element 43. Technetium is absolutely rare.